Satisfying Retirement: Unusual Retirement Options: Any Sound Like Fun? Unusual Retirement Options: Any Sound Like Fun? One of the really nice things about a satisfying retirement is the freedom that comes from deciding how you live or even where you spend your time. Some of us are happiest staying where we are now, with an occasional trip to add new experiences to our lives. 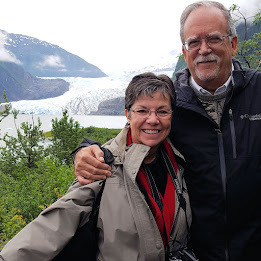 A few weeks ago I interviewed Barbara Torris on the snowbird lifestyle. She and her husband spend half the year in Tucson and the other 6 months in Portland, Oregon. Shortly after that post appeared Bill and Wendy Birnbaum came through town and showed us their 17 foot RV...home for the next two months of travel away from their normal habitat in central Oregon. For roughly the same monthly cost as a typical full service retirement community, a small but growing number of people are living for several months a year on cruise ships. A recent research study concluded that the services on a typical cruise are comparable to those in a retirement community: dining choices, escorts to dances and dining, help with doling out medicines, and daily housekeeping. Cruise ships have a doctor and nurses on board and on call 24/7, as well as a decently outfitted medical facility without worrying about health insurance or copays. Entertainment, fitness centers, libraries, and satellite TV complete the package. Between cruises, those who have adopted this lifestyle stay with friends or in a short term apartment rental or hotel. Of course living space is at a premium, but as a trade off you spend your time visiting fascinating location anywhere in the world. This retirement lifestyle could be considered a type of snowbird living. Folks spent the summer months living in an RV while serving in volunteer capacities at national or state parks. Usually the rental fee for the camping space is free, or deeply discounted in exchange for the help. The volunteers may serve as managers of a camping/RV site, teaching interpretative classes, or working in a gift shop. The story I saw told of a couple that spent last summer at Yellowstone, the previous summer at Yosemite, and plan to be at Mt. Ranier this year. 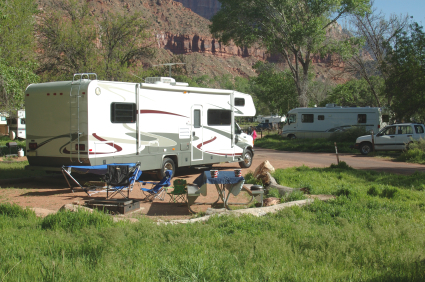 During the winter months they pull the RV to a warmer climate or spend time visiting friends. If you have an interest in living communally, this may work for you. Residents of these communities have private living spaces, but share kitchen and other facilities. There are now a handful of such senior developments in the U.S. with more in other countries. I have read predictions that most metropolitan areas will have at least one cohouse development within the next decade. Especially for those who have lost a partner or have no nearby relatives, the sense of family and of sharing one's life with others are major draws. Just as I was completing post I received a press release from a lady who has written a book about this trend, especially for older, single women. If you'd like to learn more, I have posted all the information on a link at the top of the left sidebar. Moving to a place like Costa Rico, Mexico, Belize, or anywhere else in the world is becoming a reasonable choice for many. Estimates are that over half a million Americans are spending their retirement years outside their home country. The primary reason is cost. Health care is usually 50-80% less expensive with comparable care. Many doctors in Central or South America, for example, are trained in American schools. Larger cities have modern hospitals and clinics. Housing is usually much less expensive, too. Social Security checks can usually be sent to you, though the rules vary by country. Another reason folks choose to pull up stakes and start over again is the desire for adventure and a fresh start. Retiring to another country is a major decision that requires serious thought and preparation. It is not something to be done on a whim. Learning a new language and customs while fitting into a new culture can be daunting to some, but amazingly stimulating for others. I've just scratched the surface on this topic. Additional options include some form of extended volunteer work, like the Peace Corp, or building a small apartment on the property of grown children to create a multi-generational situation without sacrificing privacy. The cruise ship living and RVing in a National Park ideas strike me as something Betty and I might want to explore.What I'd like to know is what do you think? Are any of these ideas (or others I haven't mentioned) logical alternatives to aging in place or a typical retirement community? It is kind of exciting that we do have options. What's Best: Aging in Place or a Retirement Community? Living on a cruise ship? I had not heard that one before. I have enjoyed a couple of cruise vacations, but as a lifestyle? That one wouldn't be for me. The park ranger is appealing. Out in nature, plenty of alone time, meeting new and interesting people, meeting new and interesting animals. Yes, I could see that. I've also lived overseas and met people there who had retired. Bangkok was a popular place when I was there because of the low cost of living and excellent, affordable health care. For me, though, I can't think of any place better than my back yard. Part of the story I read about living on cruise ships involved a 78 year old man from Phoenix. He lives on ships for 4 months of the year and the rest of the time in a furnished apartment. I can see having 3 or 4 trips of 2-3 weeks each throughout the year for a few years, but then the lack of space and the ability for private time would probably drive both Betty and me crazy. But, to each his own. We have been talking the last several days about wanting to break out of the pattern we have been in for the last 10 years, for at least part of the year. The RV idea has the most appeal. We couldn't live overseas..too far from family. I'll have a post soon about how much I am enjoying my backyard and home life. We'd never abandon that, but just shake things up a bit. I love living at Lake Chapala in Mexico and cannot imagine ever moving back to the states. Mexico is my home and I wouldn't have it any other way. Great to hear from you Kathy. Where is Lake Chapala? What problems are there being an expat? What are the biggest advantages? Lake Chapala is just outside of Guadalajara. It has a very large ex-pat community there. I spent off and on a couple of years there in the early 90s for work. The only problem is that I heard that the lake is almost empty. It is a reservoir for GDL and with the population constantly growing it is shrinking quickly. My daughter and I have chatted many times of a grandparent house beside theirs. It is how my son in law was raised- having both his grandmother/ father and great grandmother within footsteps of his door. We want to be able to enjoy our awkward years near family not in a facility. I think good places will be difficult to locate anyway since we will not be wealthy elderly, in any shape or form. With the crush of the new double income elderly, things will quickly change in "retirement homes" and the middle class will quickly be priced out of the newest boomer market in the next 20 years. I'd rather be with those I love anyway. We figure we have at least ten years before that time - so we are looking at a RV until then. We may license it in Arizona since it would be too expensive to license here! The idea of building an "in-law" or grandparent house that is in the backyard or attached to the main home is a trend that is growing. I read about a company that actually makes prefab housing that is designed specifically for this purpose. I think the price is in the $30-$50,000 range...much, much cheaper than a regular retirement housing choice. Bob, the idea of living on a cruise ship sounds interesting. I have gone on a number of cruises, consisting of several cruises along Mexico's Pacific coastline and one cruise to Alaska. However, with regard to the costs, I will have to wait for a while. Most likely when I do go cruising, I will go on cruises periodically but will keep my current residence as my home. Two people who I remember are a couple who were friends of my Dad's sister and her husband. This couple traveled all over the world throughout most of the year. However, when they came to visit my aunt and uncle, they stayed at a nice (but not an ostentatious) hotel in Los Angeles. It was very nice that I met all of these wonderful people at an early age. Their experiences gave me a lot of "food for thought". I would think the experiences would be a major reason for living part time on a ship, and they would have to make up for the loss of virtually all your personal living space and certain freedoms to make it all worthwhile. The cruise ship, while appearing romantic to many at first glance, might get old quickly. Of course people could say that about RVing as well, but the huge #s of Americans who do it regularly might attest to otherwise. We thought about doing that for two years straight after quitting work, selling the house and storing our possessions, but moving to this state caused us to be very happy right where we are. I have to admit I was very, very interested in moving overseas. The lower costs were a positive, and there were many places that had a large ex-pat community, as Kathy states above. While Belize is on many peoples list of places to go (English is spoken, currency is not a problem, they are very hospitable to retirees) it can be boring with not a lot of variety in food. Mexico can be of interest but the constant news on the drug cartels and violence probably scare a number of potential retirees off. The hottest spot right now appears to be Ecuador where some of the cities have a decidedly European feel to them. Prices are good as well. The great news - there are many things to do depending on ones budget, health, and sense of adventure. Great blog, Bob. Linda, aka a Bag lady in Waiting, wrote in a very positive way of her stay in Ecuador. There is a language barrier to overcome and I've heard from more than one person that Quito should be avoided. But, it is showing up more often as a choice. They all seem like very creative ideas .. . but not attractive to a homebody like me. A cruise ship? Too confining. A group home? Hey, I'll get there when they throw me into a nursing home (or so-called Independent Living, which is something that B actually looks forward to -- go figure! -- but doesn't appeal to me). Another country? I can see how that might be cool if you have ties to the country and speak the language. Alas, I'm just a provincial bumpkin who speaks only English and wants to stay in at least somewhat-familiar territory. While the experience of living overseas for a while might be quite stimulating, like you, Tom, I could never move there permanently. I'm just too used to how things operate here and I've never been good at learning languages. But, a season in Paris or a city in Austria might be just the ticket. I was so glad to read the article on co-housing and how it is a growing trend. My 54 year old niece, single and living in Washington D.C. just lost her mother. She phones and cries about how alone she is now..no one to help her or be with her. She is afraid of being alone until she dies. My daughters also are in their mid 30's, single, no children. I just read some demographics for 2040 and the number of people living alone is expected to increase greatly...something like 50 percent, with great numbers of older folks. Cruises and traveling aren't as much fun (or as affordable) when you're alone. Having an option of joining with other single women after retirement sounds like a good possibility for them and probably many others. Thanks for finding this ... maybe you can do more posts about this trend in the future??? I was completely unaware this was a growing trend. I remember communes from my youth, but this is the grown up version. It was nice timing that the press release from the woman who wrote the book happened to cross my desk at just the right time to include the link to it. I'll put a reminder in my future file and look at the subject in more depth at some point. If you go to www.seniorcohousing.com they have more information available, too. I love cruising, but I don't think I could live on a ship. A long cruise would be great. There was a lady who lived on the QE2 for years and she loved it-she was a widow and made friends with the staff. If I lived in another country, I would be concerned about the health care. Good basic care may be available-but if I get a serious illness, I think I'm better off here in NYC. I do like the idea of a retirement community-where you have your own apt/house and meals and services are available. I would try something new on a temporary basis before making a decision. The shared housing environment might be perfect for widows/widowers, singles, or a very social couple. With the right blend of privacy and sharing I can see that as an attractive alternative. My understanding is that in many foreign countries, in larger cities, health care is on par with ours. In reality, America ranks below most other developed countries in quality of health care, hospital deaths, infections, etc. The only places we really shine are in advanced technologies and costs! Rationally all that may be true. But, like you, I'd rather be stateside if I needed a major procedure. Volunteering to be Campground Hosts may be in our future, or possibly working a concession stand at a National Park over a summer. Either would provide us with a free campsite for a summer, leaving us ample free time to explore and hike. Actually, I think we're like the concession stand idea better and better . . . campground hosts sometimes have to deal with unruly or cranky campers. Working a cash register sounds like a lot more fun! Working a gift shop or as a hiking guide might be better. Good idea. I know a number of hotels in Denali Alaska offer rooms and pay for the summer to supply workers for their shops. Students don't do it because they are needed until September! 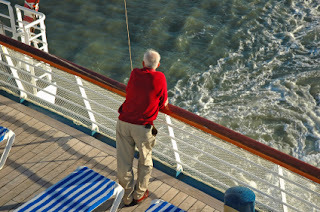 I do love to cruise but can't imagine doing it for long stretches of time for many reasons. I wouldn't want to be away from my family that long, for one, and the privacy and small personal space would start to get to me. I agree with you about being able to take several cruises each year but I doubt that's going to work in our budget. We've found a wonderful place here in Philadelphia for my father-in-law that we believe works perfectly for us when the time comes. It's less expensive than most retirement communities we've seen or heard of. It's right in the heart of the city, which we love, with amenities rivaling a 4 star hotel. I think we'll stick with that and hope we can afford a cruise each year. It's interesting though to see the ideas that are out there now. By the time I'm ready who knows what wonders there might be? Substituting a cruise ship for part of the year for my retirement home is really a non-starter for us, for the reasons you mentioned. But, a few cruises a year may be a reasonable vacation choice for us at some point in the future. When we are ready to move to a smaller condo we would like it to be closer to either downtown Phoenix or downtown Tempe. Being able to walk, use buses or light rail are very attractive to us. Yes, there are retirement options as varied as there are people. I'm glad several comments so far have mentioned different choices. Cruising for a longer period of time sounds inviting - no responsibilities, lots of entertainment and activities, 24 hour food. However, I get seasick easily, and I've been on 2 cruises where I've gotten violently sick. So probably not for me. Park work - I've done some research on this and it's definitely on my radar for my retirement. I can't speak for the national parks, but in the Texas state parks the campground hosts (official name) serve as information points, sell firewood, and provide unarmed security. They have a radio to call the park ranger in case of any problems. At some parks they also clean the baths and showers and/or work in the store or other facilities. A full hookup site is provided. Living overseas - been there done that in the military. Don't think I would enjoy being that far away from family. The campground host idea is looking like something we really want to check on. Of course, that requires an RV but that is moving up our hit list rather quickly. The response to the cohousing option indicates I should do a follow up post with more information. It seems an excellent choice for certain people but I'll do more checking on costs, pitfalls, and so on. You might check Milagro in Tucson, Bob. Living on a cruise ship sounds like fun. It's not something I would ever have thought of but it is like a floating city and they take good care of everyone on the ship so why not? I forgot to add that there are a number of widows at the church I attend and they have lived in groups of three and two at different times. a raised rent, and different personalities have caused them to regroup or go out to live alone again but for the most part it has worked and they are all still friends. There have been some not-so-good items in the news recently about cruise ships, but that isn't the norm. They are generally a safe and enjoyable way to travel. The shared-housing movement isn't new, but the attention being paid to it by various businesses has raised its profile. I'm anxious to dig a little deeper and find out more about it. I don't think living in another country is unusual anymore.. I like the live on a ship idea. It can be fun. But really, what you should make sure is for your retirement money to be insured and should have a guaranteed income throughout your retirement life regardless of what happens to the market. The net income has to be guaranteed. I doubt many would disagree with you, Christie, that income should be guaranteed. The only problem is nothing is guaranteed anymore. Any insurance company can go out of business making your annuity worthless. Any investment, regardless of whether it is AAA+ rated or not, is not completely risk free. A lifetime pension no longer means what it once did. Do you need t be a member of this group to weigh in? I read all the comments and offer up the following--the gentlemen who lives aboard a cruise ship may be using this option to escape summer heat and associated costs of A/C. Folks thinking about an international retirement should travel a bit and rent for a year or two before they buy--or rent, it's not expensive except in big cities and deluxe tourist areas. Healthcare is very good in several, if not many, countries besides the USA. If your family welcomes you into their compound--and that's what appeals to you--go for it! This too could go sour after a few months--so have a Plan "B" ready. For me it's a function of how I want to live, what I want to do--and what I can afford. If family comes first--try that. If adventure is what you're longing for--go there! 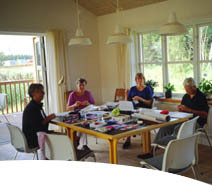 If you yearn for community-- try co-housing, or become a volunteer at home or as an ex-pat abroad. We may be getting older--but the world is still our oyster. Live! You are a member by reading the blog! You are a valued contributor by leaving a comment. There is a wide range of options to choose from, that's for sure. As you are probably aware, retiring overseas is becoming much more popular, primarily for cost, but also the stimulation of living amidst another culture. Retirement Vacation Ideas Galore: Get Packing !